I’m now well and truly engrossed in John Muir’s writings. The early years stuff about his childhood in Scotland, then as settlers in America is an amazing document of rural existence in the mid 19thC. But it’s the bit from the age of around 15 that things start to really get interesting. It begins with some rather harmless stories of how he would only sleep for four hours so that he could get up and read in accordance with his fathers strict religious rules. And then, starting with a little saw mill, the young Muir builds a series of machines and inventions: A simple alarm clock, a clock which tips you out of bed in the morning, a clock which doesn’t just show the time, but the day, month, year and lights the fires in the morning, a clock shaped like a scythe to symbolise Father Time – all whittled by hand from hickory. He also created a thermometer built from a big chunk of steel he found lying around – the expansion and contraction was amplified by a series of levers and pulleys so much that it would register the warmth of someone walking past. In 1860 he took some of his inventions to the Wisconsin State Fair in Madison – hitching a ride right on the front of the engine on the railway so he could see how it all worked. Coming from a poor farming community he presumed his inventions would be regarded as some rural novelty conscious that most machines were made in iron and steel and brass. Instead the pure craftsmanship and technical mastery of his pieces were given centre stage in the fair. On my first trip out exploring the Trossachs with one of the Park Rangers, we came across one of the elegant and solid aqueducts in the forests just outside Aberfoyle. The striking perfectly engineered, horizontal black trough contrasted with the millions of vertical softwoods in this vast plantation. There was something tantalising about the way it seemed to emerge from one side of the forest and, revealing itself briefly atop the three slender pillars, disappears again the other side. Much as you catch those rare glimpses of deer – long enough that you get a good look at them and you are reawakened to their presence, but just as quickly disappear again. You know they are there and when you spy one its a magical moment, but their invisible presence is everywhere. 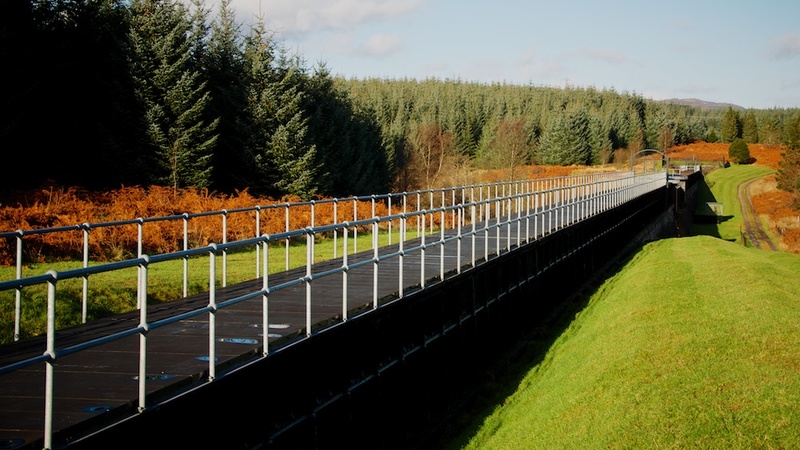 There’s several of these aqueducts in the Loch Ard Forest. Some towering above deep valleys, others mere inches above the ground over smaller becks. These form an important supply route of clean water from Loch Katrine to the tenements of Glasgow. In the mid 19th C. as the population of Glasgow grew, the supply of drinking water became a major issue. Originally water was taken from the River Clyde to water works above Cunningar Loop (where another couple of artists residencies are happening at the moment). However, frequent outbreaks of Cholera proved it to be a problem. The solution was to be found in the untouched waters of the Trossachs. 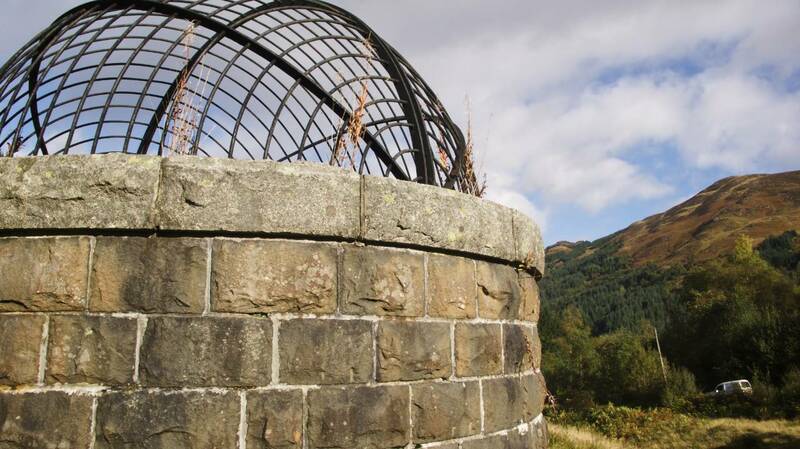 In 1852, superstar engineer John Frederick La Troube Bateman – who had previously resolved Manchester’s drinking water issues – worked out that the 227million litres (50 million gallons) a day needed for the city could be made available by raising the water level of Loch Katrine by just 1.2m (4 feet). 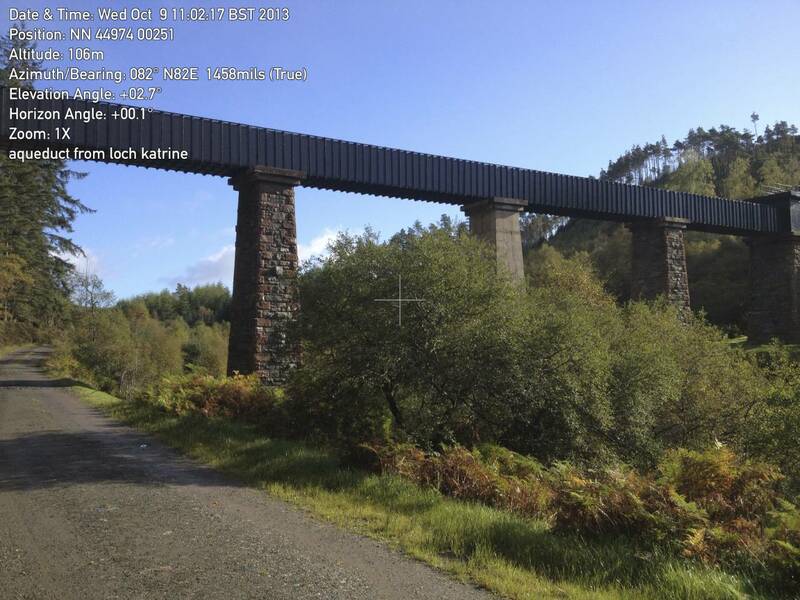 The route from Loch Katrine to Mugdock reservoir in East Dumbartonshire then onward to the rest of the city was major feat of engineering. 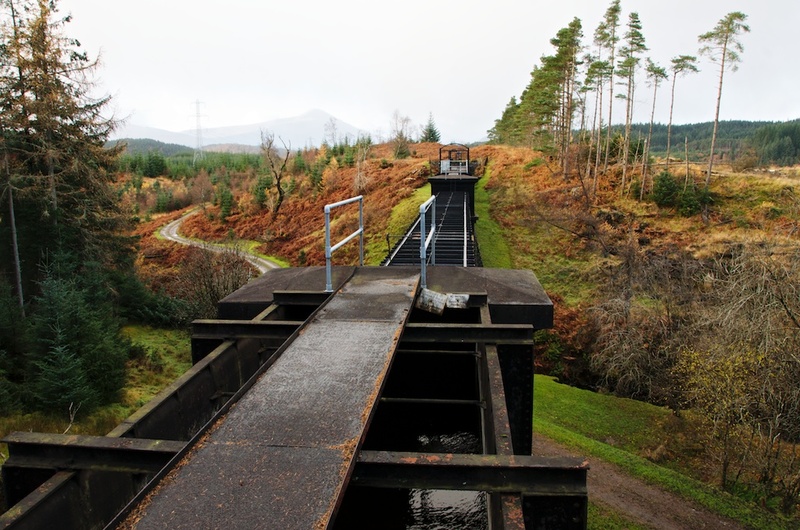 The supply is just gravity fed along the route – there are no pumping stations as far as Milngavie. The first 25 miles to the reservoir being the most challenging. the route being as direct as possible meant tunnelling through mountains and bridging deep ravines. The majority of the route lies in a 2.2m diameter brick lined tunnel under the ground. Mostly this was done as ‘cut and cover’ where the line was dug down then covered over. The foothills of Ben Lomond were more challenging. The longest single tunnel as the water leaves Loch Lomond was bored through hard bedrock at around 600ft below ground accessed by 12 shafts and drilled by hand – this was before the invention of pneumatic drills. There were 60 drills in constant use, with each drill bit only lasting long enough to drill an inch. The apart from a couple of steeper falls, the aqueduct was built to a level fall of just 6 inches per mile. That kind of gradient is so slight as to be invisible – not enough to make a football roll, but enough to ensure the water kept flowing and negate the drag caused by the brickwork. Along the route are over 3 miles of bridged aqueduct. Here the water is carried over lower ground in cast and wrought iron troughs supported by stone pillars. The longest one (nearly 400m) is at Corrie. It’s a level of precision and expertise that made such a scheme possible. You can’t but admire the skill to achieve that kind of detail in something hewn by thousands of hands without any powered machines – much the same way as John Muir’s inventions were so admired at the same time – the Loch Katrine Aqueduct was opened by Queen Victoria in 1859 and water reached the whole city by 1860 – the year John Muir showed his work at the State Fair. 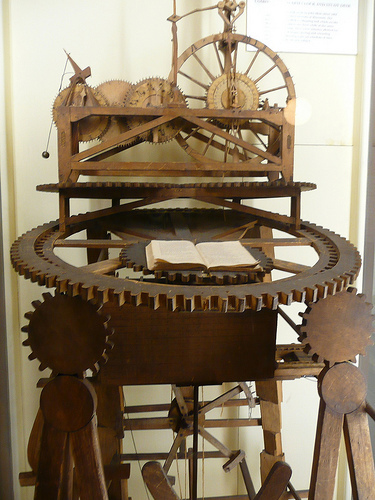 In fact both Muir’s machines and the aqueduct are powered by gravity and have their own relationship to time – two of the biggest constants. I find something poetic about that relationship between precision engineering and the ruggedness of vast landscapes. Something definitely worth exploring further I think. This entry was posted in history, landscape, research. Bookmark the permalink.